In February, we shared the worrying news that nine in ten patients who are diagnosed with pancreatic cancer as an emergency presentation will sadly pass away within a year. As a result of this, we decided urgent action was needed so our CEO Ali Stunt sent a letter to the Health Minister, Jeremy Hunt, to ask that this issue was addressed as a matter of urgency and requested a meeting to discuss this further. 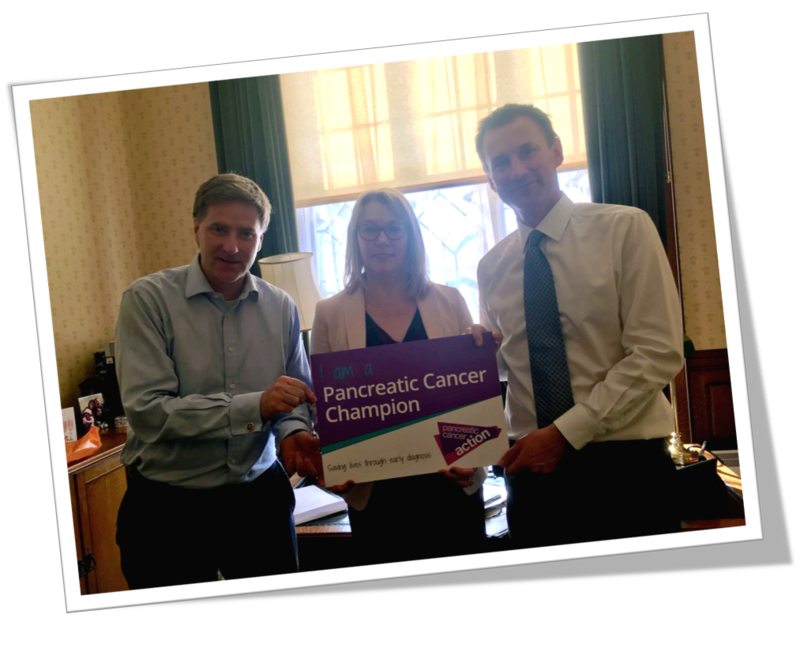 We are pleased to say that Mr Hunt responded and Ali Stunt, CEO of Pancreatic Cancer Action, along with some of the PCA team, met with the Health Minister on Wednesday 18th April. Steve Brine (left), Ali Stunt (centre) and Health Minister Jeremy Hunt (right). We were given half an hour with Mr Hunt to express our concerns and make recommendations on how to address these issues. Pancreatic cancer survival rates have barely changed in over fifty years. Only 5% of patients survive more than five years and only 1% survives more than ten years. Pancreatic cancer is the fifth biggest cancer killer and is set to overtake breast cancer as the 4th by 2030. Incidence rates of pancreatic cancer are increasing in the UK (between 2010 and 2015 incidence increased by 17% and mortality by 13%) and increasing at a faster rate in some regions. The lack of government research funding for pancreatic cancer. The inequalities across the UK for patient care and treatment. We also suggested some practical recommendations on how best to tackle these issues and what we, Pancreatic Cancer Action, can do to support the government in implementing them. Jeremy Hunt, along with Steve Brine, agreed to look at two key recommendations, namely a clinical audit for pancreatic cancer to identify and spread best practice across the UK, increasing public awareness and GPs’ knowledge of diagnosis and treatment of the disease. In relation to the lack of government contributions to pancreatic cancer research funding, Jeremy Hunt suggested that we need to improve the quality of research proposals. He agreed to provide us with some practical advice to achieve this, which we can then share with the wider pancreatic cancer research community. We also provided Mr Hunt and Mr Brine with a pack of information that included pancreatic cancer facts and figures, patient stories and details of our Pancreatic Cancer Aware campaign. Pancreatic Cancer Action will follow up with the Health Minister and the Junior Health Minister outlining everything that was discussed in the meeting and the action points that were put in place for both parties. We also suggested a follow-up meeting to discuss improvements and changes that have been made. Overall, we felt the meeting went well and we feel very positive that this is a step in the right direction for improving pancreatic cancer survival and the quality of survival for patients in the UK. We are very hopeful of some meaningful action as a result.